Yes, there were 14 calculated re-entries on the list that would have been visible in Canada. There were 53 UFO reports that matched these re-entries. However, nearly all of these cases were already considered to have explanations or probable explanations by the UFO investigators themselves. And most were considered to have been bolides or re-entries, anyway. But Molczan's work shows that UFO investigators are on the right track when it comes to trying to identify UFOs reported to them. How many more UFO sightings can be matched to known spacecraft re-entries? One of the common explanations for reported UFOs is that of misidentified satellite or rocket booster re-entries. UFO investigators often check UFO sighting reports against lists of satellite observations as a matter of course. Skeptics have suggested that many “unexplained” UFO reports are unrecognized spacecraft re-entries, including some of the more well-known and heralded unexplained UFO cases. Recently, a list of visually observed re-entries was generated by an expert on such things in the course of an explanation for one particular reported unexplained UFO case: the giant “mothership” seen by dozens of witnesses in the Yukon Territory on December 11, 1996. The case has been the subject of intense investigation and considerable debate, but UFO proponents insisting the observed object was mysterious, but skeptics are adamant it was simply a re-entry of a rocket booster. The list is quite interesting because it allows a comparison of known re-entry data with UFO data from the 25-year period of study of the Canadian UFO Survey. Out of 14 re-entries on the list noted as being observable in Canada during the past 25 years, four did not generate any UFO reports at all. There were 53 UFO reports that matched times of re-entries, all but three of which were either explained, had insufficient info or were thought to have possible explanations (and noted by the UFO reporting organizations as bolides or re-entries). In other words, ufologists were able either to identify the re-entries as what they were or did not consider them UFOs in 50 out of 53 reports. This can be interpreted to show that UFO investigators are generally able to differentiate misidentified UFOs in at least 94 per cent of cases known to be spacecraft re-entries. Ardent skeptics may not be the only ones capable of explaining UFO sightings. Also, one only has to look at the descriptions of other misidentified re-entries in the list to see that witnesses in most cases used terms such as “fireball,” and “ball of light trailing sparks,” “tail on fire,” “comet-like,” “airplane on fire” and so forth. The Yukon case involved multiple independent witnesses who described large objects with a shape and form, not just strings of lights that could be a fragmenting re-entry. Also, debunkers note that UFO investigators investigate UFO cases in a linear progression of steps, with “Step One: Assume the testimony is reliable.” They note that eyewitness testimony is in fact usually unreliable, so that judging the worthiness of a UFO report on witness testimony is inappropriate. However, as we have seen in this brief study, witness testimony was considerably reliable in explaining known fireball cases reported as UFOs, investigated and classified by UFO investigators themselves. In summary, the excellent work by Molczan in compiling a list of spacecraft re-entries that might explain some UFO cases is admirable. However, UFO investigators without the list were generally able to assess the validity of UFO reports shown later to match the re-entries. The one standout case was that of the Yukon case of 1996, which is still debated among ufologists and debunkers. It is recommended that all ufologists familiarize or reacquaint themselves with the appearance of terrestrial spacecraft re-entries, and ensure the possibility of such an event is considered when evaluating UFO reports. 1989 11 15 1900 Chibougamau PQ NL fireball NRC I N89/75: 15 diff. reports of lights moving in sky, "fireworks"
1989 11 15 1900 Val D'Or PQ NL fireball NRC I N89/75: light moving, like "fireworks"
One UFO report was found matching the re-entry perfectly. It was classified as Unknown because the witness was a reliable observer. However, the witness only reported “lights,” so no structured object was described. 1996 4 14 0312 Caplan PQ NL yellow ps SOS OVNI P "airplane in flames"
These four reports appear congruent with the re-entry event. Two had insufficient information, and one was listed as “Probable Explanation” because of the description “airplane in flames” which is a common description of a fireball. The report listed as “Unknown” is curious because it has descriptors unlike a re-entry. The sighting at 0315 hours local was noted as a “Close Encounter,” yet in time and location matches the re-entry. New Brunswick: St. John - glowing near perigee, day prior to fall from orbit. No sightings reported during this time period. Although the Molczan list suggested this re-entry would be observable over the Maritime provinces, no UFO sightings were reported. Similar to Case 2, although the Molczak list notes widespread observations. No one reported seeing any UFOs at the time, even though there was at least one news report about the event. However, this case is the noted “Giant UFO in the Yukon” for which there have been found numerous witnesses long after the fact; this sighting was therefore not included in the 1996 Canadian UFO Survey. No UFO reports received during this time period. 3 bright lights in triangle, changing positions; bolide? 4 independent reports of triangles and pairs of lights; rocket? 2001 08 12 0045 Halifax NS NL fireball 3 7 NUFORC E bright obj. w/3 "jets of flame" moving N-S; Russian rocket? 2001 08 12 0035 Halifax NS NL white fireball 3 5 NUFORC P obj. w/tail "like a Navy flare"
The two reports around 2100 hours on January 31 could match this re-entry. One was suspected to be a re-entry, while the other did not have sufficient information for evaluation at the time. One report received during this period, explained by investigators as an early morning satellite re-entry. None of these reports received that night seem congruent with the re-entry listed. However, MIAC recorded a bright fireball a few hours earlier; perhaps this was a fragment? None of these UFO reports were classified as Unknowns. This was obviously a well-witnessed re-entry event. There were 22 reports from that area on that date, with 19 apparently related. The DD report at 1100 is clearly unrelated, for example. It is interesting to see that the time of observation varied considerably, from 2145 to 2300 CT. Most reported times do generally agree with the actual time of re-entry. Also, in all but one case, the report was recognized as a fireball and/or re-entry and given a classification of “Explained.” The single exception was the report from Windsor in which witnesses reported seeing a fireball, but then also saw 3 small objects after the original event, leading to an “Unexplained” evaluation of the report. These five British Columbia UFO reports match the re-entry and were easily identified or suspected to be fireballs or re-entries. What this tells us, as we noted in our annual Canadian UFO Surveys and also the more recent 25-year study on UFOs in Canada, is that people continue to report seeing objects that are physically in the sky and are not hoaxes or hallucinations. They are real objects, and many can be explained. But a small percentage are left without a simple explanation. 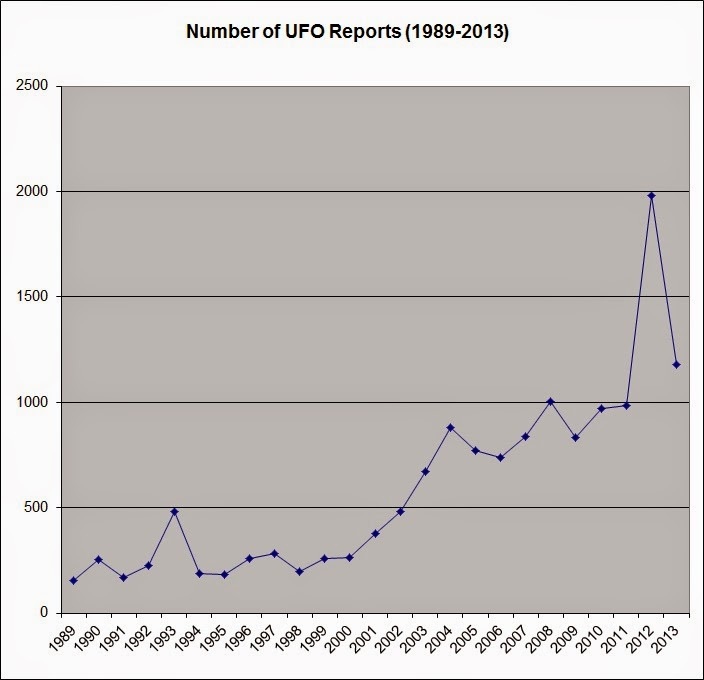 Ufology Research has released the results of its 25-year-long study of Canadian UFO reports. Most ufologists and Forteans know that Ufology Research, formerly UFOROM (Ufology Research of Manitoba), has been collecting and reviewing Canadian reports since 1989, publishing the results as the annual Canadian UFO Survey. When the 2013 edition was published in 2014, it marked 25 years of the annual analyses of UFO report data. It seemed reasonable, then, to group all 25 years of data together and examine the data for trends and changes with time over a quarter of a century. When the final tally was produced, there were almost 15,000 UFO reports received as data since 1989. Coincidentally, this almost exactly matches the total number of UFO reports collected and analysed by the United States Air Force Project Blue Book during its official run of less than 20 years from 1952 to 1970. The Ufology Research study is titled "UFOs Over Canada: 25 Years of UFO Reports." It is available from the Canadian UFO Survey web page here. In addition to the text document, the entire 25-year report database is also viewable. The 25-year study should not need much explanation to those familiar with the annual Canadian UFO Survey. However, an outside reviewer has suggested I make a few points to clarify the process of collecting and analyzing the data. Second, a word about hoaxes. In short, while hoaxes cannot be ruled out, the number of hoax reports that have ended up in the database is quite low. In fact, in most cases where a hoax was suspected or discovered, this has been noted in the data. One reason why hoaxes are minimal with respect to the larger body of data is because a very large percentage of reports could be explained or thought to have possible explanations. In other words, these reports were not hoaxes but honest mistakes, and there were real objects in the sky to misidentify. Third, although we believe we have captured a rather complete set of sighting report data for this study, the database may not include all Canadian UFO sightings during the past 25 years. It is known from other studies that only a fraction of all UFO sightings are ever reported―this percentage is thought to be around 10 per cent. Our study reflects only those sightings which were actually reported to UFO groups or official agencies. Also, which we were able to obtain many reports from official agencies, it is very possible that an unknown percentage of cases are never officially released, although the Canadian government has been very transparent in this regard, with thousands of UFO-related documents always being available to the public either at the National Archives in Ottawa or online. Next, our study shows that people are reporting sightings of unusual objects, some of which have no simple explanation. This result has no overt bearing on the question of extraterrestrials visiting Earth. The interpretation that some of the unexplained cases may represent alien visitation is left to the reader to speculate. What can be said is that UFO witnesses have, in general, not been hallucinating or making up tall tales; UFO witnesses are indeed seeing unusual objects in the sky for which they have no explanations. Also, while the level of good investigation of UFO sightings has been regrettably low, some UFO groups such as MUFON have made excellent strides in educating lay investigators and encouraging proper UFO investigation. Finally, this study was only made possible through the dedication of a handful of individuals who have taken the time to express curiosity about what has been reported by Canadians as UFOs during the past 25 years. Data collection is very time-consuming, and moreso thorough case investigation, which is done only rarely in the present-day field of ufology. If every one of the nearly 15,000 cases studied were completely investigated, what would the results have been? Regardless of one’s belief in the “reality” of UFOs (however that may be construed), studies such as ours affirm that there is a persistent phenomenon that deserves further scientific study. If UFOs are not “real,” then why are tens of thousands of Canadians (and others worldwide) seeing unusual objects in the sky? Is there a need for better education of the masses? If there is a residual percentage of truly unexplained cases, what do these represent? Alien visitation? Clandestine military exercises? A hitherto unrecognized natural atmospheric phenomenon? Our study 25 Years of Canadian UFO Reports is presented for your consideration.